Child Recruit at Chelvan's Funeral? A picture taken at Thamilchelvan's funeral on the 5th has raised some eyebrows. In it a small child is shown standing behind a group of LTTE cadres carrying the remains of Chelvan to the Cemetery in Kilinochchi last evening. The child, possibly a girl, is dressed in the LTTE camouflage. Whether the child was dressed-up for the occasion or not and if so why was she walking alongside Chelvan's remains is unclear. 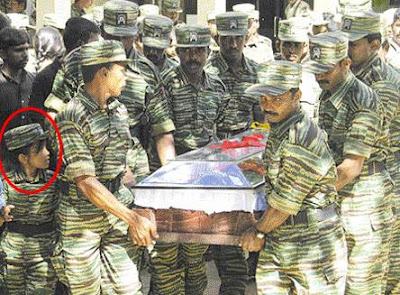 The Island Newspaper indicated the picture was among the first images released of the funeral by Pro-LTTE media only to be withdrawn momentarily. Another image of a child soldier, acting as Chelvan's bodyguard was released soon after the attack on Thuruaiaru hideout last Friday. He was among those killed in the attack. Well it seems to me like a child in the LTTE uniform which is a common incident in any military function. I have seen dozens of children in uniforms in many military functions. He is about 8 to 9 years old. i believe that is tamilchelvan's daughter contrary to reports that his family lived outside of Ceylon. A kid wearing a miltary like uniform doesn't prove he is a child soldier. And there is enough strong evidence to prove child soldiers. However this pic is good for our propaganda. Just after TC killed UN-tigers put Hitie issue. If this happened in Karuna or GOSL related activity I am sure these international media publish this pic may be without commenting. And our COlombo HR champiouns explain how we have militarized our children. can you confirm this? We heard this few years ago too. 70,000 motars ordered by GOSL from Zimbabwe going to LTTE. I think for the sake of propaganda its great that the island latched onto this. The mortar story is dead on accurate. They bribed a middleman and got them loaded onto their floating warehouses. http://www.sankathi.net/ published this photo and later they remove child from the photo. I think this is not a child soldier. I heard many people say this is TC's daughter. But no way to verify. Since TC's wife also a woman carder this girl may follow her father's and mother's one day. Defencewire...These mortars..have they reached SLanka yet and did we have to pay for them? As far as I know, it ws not 70,000 motars that went missing but 70,000 motar rounds. LTTE may use child looking adults (like that black "boy" of 30 years in a famous US TV series) for suicide attacks, infiltrations,.. TN has a stock. It was 32,400 81mm mortar rounds from Zimbabwe Defence Industries in May-June 1997. They were later fired at us during Operation Jayasikurui.